Bill Kenwright’s acclaimed production of Tim Rice and Andrew Lloyd Webber’s monumental musical Evita returns to London for a highly anticipated summer run. Starring West End leading lady Emma Hatton as Eva Perón, the production plays a strictly limited 12 week season at the Phoenix Theatre as part of a thrilling national tour. With the performances marking the 65th anniversary of the death of Eva Perón, which is to be commemorated in Argentina in July, the musical documents the rise of the enigmatic figure from humble beginnings to being heralded as the ‘spiritual leader’ of the Argentine nation. Featuring a legendary score that includes show-stopping numbers such as “Another Suitcase in Another Hall”, “You Must Love Me” and “Don’t Cry for Me Argentina”, Evita is widely regarded as one of Rice and Lloyd Webber’s best musicals. Emma Hatton stars as Eva Perón, with numerous West End credits including Wicked, We Will Rock You and Dreamboats and Petticoats. Hatton plays opposite Gian Marco Schiaretti, who makes his West End debut as Che. Further cast members include Oscar Balmaseda, Sarah O'Connor, George Arvidson, Lewis Barnshaw, Jessica Ellen, Callum Fitzgerald, Kellie Gnauck, Dominic Adam Griffin, Joe McCourt, Jude Neill, Jordan Oliver, Chrissie Perkins, Oliver Slade, Matias Stegmann and Yuval Zoref. Produced and directed by Bill Kenwright, alongside Bob Tomson, Evita features choreography by Olivier Award-winner Bill Deamer, design by Matthew Wright and sound design by Dan Samson. Evita was last seen in the West End in 2014 at the Dominion Theatre, starring Argentinian actress Madalena Alberto. 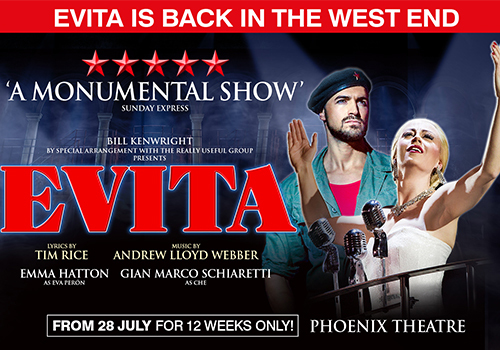 Expected to be one of the theatrical events of the summer, Evita plays at the Phoenix Theatre from July 28th to October 14th 2017, with an official opening night on August 2nd 2017. Evita is recommended for those aged 10 and up.